KARACHI: In another heartbreaking incident at Sea View, a judicial magistrate in Karachi on Monday granted police a two-day physical remand of the prime suspect in an incident of firing at Karachi’s Do Darya a day earlier in which one youth was killed and another injured. Law enforcement agencies (LEAs) have taken into custody the primary suspects involved in the mysterious road rage incident on Sunday. Authorities have recovered the third car alleged to have been involved in the incident that killed one person and injured three others as a vehicle was fired upon. Police said they had seized a black-coloured double-cabin vehicle but the search for those inside the car was still underway, with raids being conducted in PECHS, Kashmir Road, and adjoining areas. 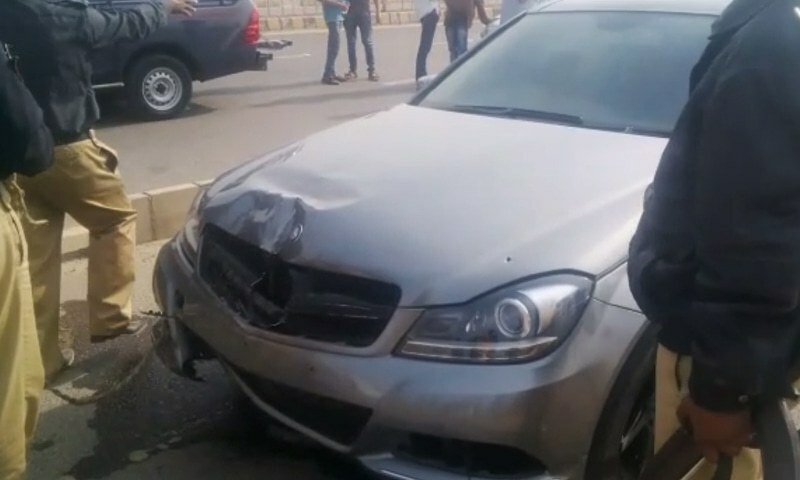 Eyewitness accounts claim that four people were on their way from Do Darya in Phase 8 of the Defence Housing Authority (DHA) in a car when they reportedly hit a sports bike from behind and sped away. A few moments later, their car was chased down, stopped by a double-cabin vehicle, which was escorting the injured biker, and was fired upon by people from inside. Police said that after allegedly firing at the car at least nine times, the men in the vehicle climbed out of and beat up the passengers killing one and injuring three others. The deceased was identified as 18-year-old Zafir. Police immediately launched a search for the vehicle and assailants, while a forensic team collected evidence from the site. Later, Senior Superintendent of Police (SSP) for South told the media that four suspects had been arrested from Khalid bin Waleed Road while the pick-up was also seized. Among the suspects is Khawar Burney, who allegedly opened fire. Authorities also recovered weapons from the detainees and filed a case in this regard. In a statement to the police, the main accused Burney said he tried to stop the ‘Mercedes car’ when he witnessed the accident, engaging in aerial firing in order to stop it. As he fired, his pistol moved upwards by mistake, he narrated, adding that the bullets hit the people inside the car. The motorcycle rider Dr Abdul Rahim has disassociated himself from the incident, saying he doesn’t know either Burney or the deceased. The investigating officer in the case said the deceased, Zafir, died of wounds from two bullets. The vehicle he was riding was shot from the left side. The bullets hit Zafir in the chest and hand, the officer said. Chief Minister Sindh Murad Ali Shah took notice of the incident and has sought a report from the additional inspector general of police. Speaking to the media, DIG South Azad Khan said that deployment at known racing venues will be increased and a crackdown against illegal street racing will also follow. He explained that there were two types of illegal street racing, the first is when two drivers going down the road suddenly start competing with each other and the second, when planned illegal street racing events are organised. While the increased deployment will have an impact on the planned illegal street racing meet-ups, Azad added that the police will have to collaborate with the Traffic Police to combat the other unplanned street racing phenomenon. When asked when asked if there needs to be a collaboration between other government departments to restrict vehicles from being modified specifically for illegal racing purposes, Khan responded that it was an area that would also be looked at.